The origins of the Jingle dress date back to the early 1900's and comes from the Ojibway people in Northern Minnesota. There are variations of the story but the basic story is a granddaughter was very ill. A medicine man (some stories say he was her grandfather), had a dream or a vision where he saw the dress and knew he had to make that for her to wear so she could get better. They did so and put it on her. At first she had to be carried around the circle, then helped around and finally she was able to dance for herself around the circle. The dress is known as a 'jingle' dress because of the happy, tinkling noise it makes. It is sometimes referred to as a 'medicine' dress and is still considered a 'blessing' dress today even though in pow-wow circles many young girls just love it because it makes a tinkling/jingling noise when they dance. Originally, the jingles are made from the lids of snuff cans, bent and molded into triangular bell shapes and attached close to each other on the dress with ribbon or fabric. Nowadays you can just buy packs of pre-made jingles. The designs can be simple or complex and in any color. It takes between 400 and 700 jingles to make an adult jingle dress. You can hear the 'jingles' when dancing. 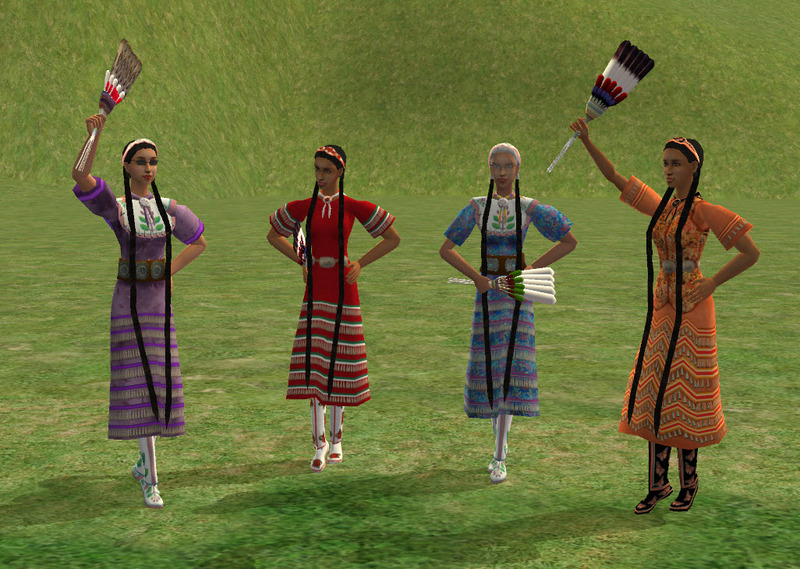 The 'jingle' dress dance steps are light and on toes (not flat footed). There are no high kicks or twirls that you'd see with fancy shawl dancers. The Jingle Dress dancer raises her fan (modern pow-wow) or her hand (traditional) when the "honor beats" are played on the drum. As in all dances, the Jingle Dress dancer must stay in time with the drum beat and stop with both feet on the ground on the final beat. 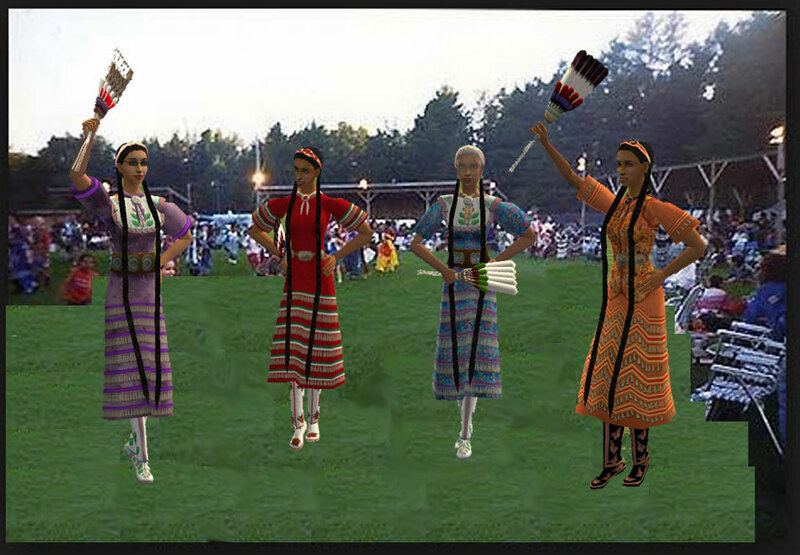 If you are curious, here are some jingle dress video clips on YouTube. The first one is a story about the original iingle dress dream and the original dance. Fort Hall built a new pow-wow arbor in 2009 and asked the jingle dress dancers to come out for a blessing of the dance circle. Given the limitations of the Sims2 mesh boundaries. I could not make individual jingles and get them into the package. I tried, but it was WAYYYY over the vertice allowance so I had to revert to the painted on variety. 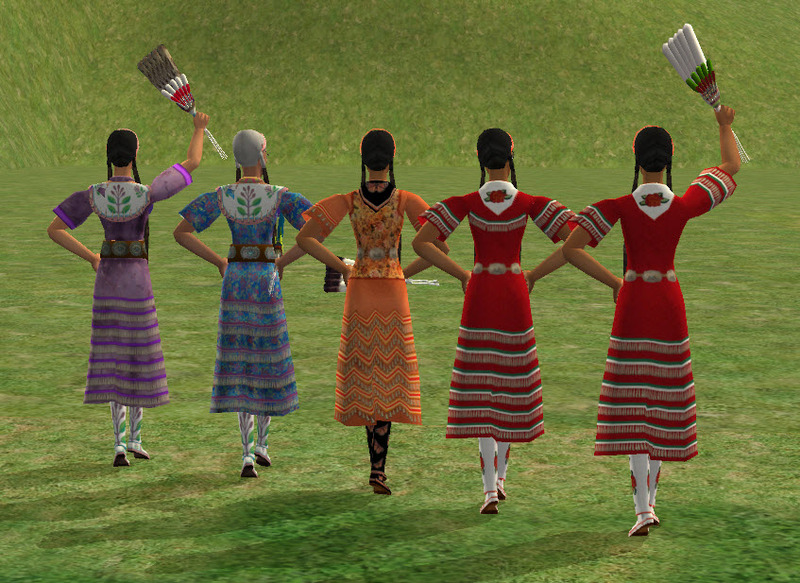 So imagine that they move when your simmies wear the dress. The jingles will 'stretch' when your simmies move about - can't help that. 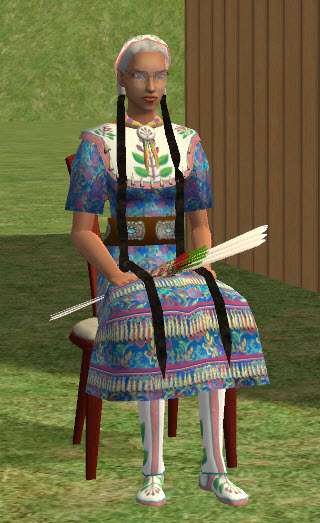 I have ALL Sims 2 EP's but I cloned base game dresses and accessories and hair so this should work for you no matter which game you have or don't have. Of course, you'd need University for the young adults. Get the entire Dress set for all ages - Toddler, Child, Teen, Young Adult, Adult and Elder females. Sorry guys, no switch dancers in this set. If you want to pick and choose individual items look in the comments section under the individual ages. Flat Fan for - Teen, Young Adult, Adult and Elder females only - I did not make fans for the girls and toddlers. I cloned glasses to make this so you'll find it under the glasses. Flat Fans are held in the right hand when dancing. Your simmie will carry the fan around in their hand. They can't put it down until you remove it because it uses the hand's bone assignments. Also, when the teens do that awful, pouty slouch it makes the fan intersect their stomachs. I can't help that as long as you understand I can't fix the issues caused by game postures. The fans work for elders, adult, young adult and teen females with any glasses. You'll need University to get the Young Adult. Beaded headbands that match the outfit beadwork for Teens, Young Adult, Adult and Elder sims. I cloned these from glasses so you can wear them in any combination. This is all of them. To get individual pieces look in the comments section under the different ages. The hair is not finished for all colors nor is it binned. I ran out of time for the Multicultural contest. When it's ready, I'll upload it. You can see what it looks like in the pictures. It is braided hair with Otter Fur wraps to make the braids seem very long. The long wraps have correct bone assignments so they bend correctly with the body. I invite people to make their own recolors, upload them and share your creations. I have included the UV map to encourage you to make some recolors. Special Thanks to NixNivis for the wonderful dance poses! The N8iveSims mod group is open for new membership! We are looking for texture artists, meshers and animators. 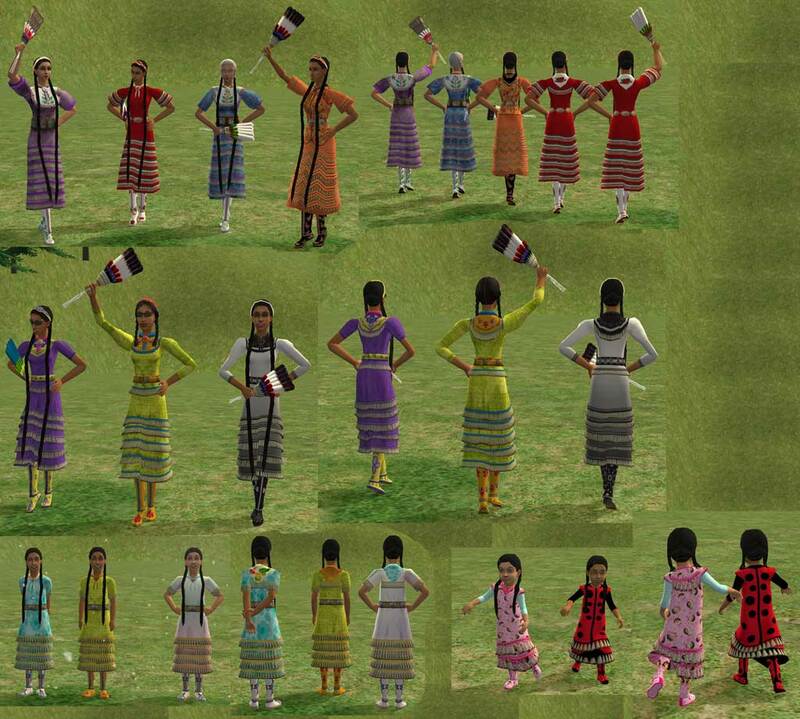 Sims 2 or Sims 3. If you like these items, there are more projects in the queue. Sorry, I goofed up the teen mesh. I've rebuilt it. Please delete the following files and get the new mesh and recolors.